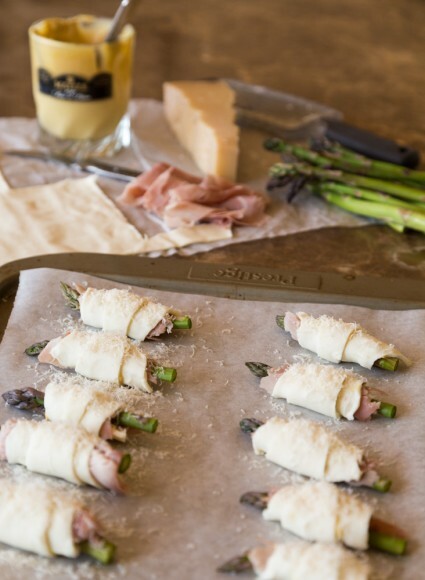 I really like this combination of asparagus, prosciutto, mustard and parmesan. It is a great way to make use of in-season asparagus. I have not said how many this makes as you really can make however many you need. I would plan on each guest eating two wraps. Trim the asparagus so that each spear is about 2 – 3 inches in length. If you are using baby asparagus, you can skip ahead to assembling the wraps. If your asparagus is on the thicker side, however, you’ll need to blanch it so that it is completely cooked through: Fill a large bowl with ice water and set aside. Bring a pot of salted water to a boil, and add the asparagus. Blanch for 1 – 2 minutes and then transfer with a slotted spoon to the bowl of ice water. Drain and dry the asparagus. On a clean work surface, lay out a sheet of puff pastry and using a pizza cutter or sharp knife, cut diagonal lines in a zig zag pattern across the width of the sheet to make long triangles. (Make sure that the widest end of the triangle is shorter than the length of the asparagus so that the tips of the asparagus will poke out once wrapped). Smear each triangle with mustard and top with a slice of prosciutto and one asparagus spear. Roll up the triangle, starting at the widest end, and place on a baking sheet lined with parchment paper. Repeat this process for your desired number of wraps. Brush each wrap with some egg wash and top with finely grated parmesan. Bake in the oven for 15 minutes or until your puff pastry is a nice golden brown. Check the sides of your puff pastry to make sure it is totally cooked. If in doubt, leave in the oven for a few more minutes. You don’t want to serve raw puff pastry to your guests!